According to the National Institute on Drug Abuse more than 6.2 million people in the U.S. overused prescription drugs in 2011 and the number is steady rising. Unfortunately many Americans use pharmaceuticals for purposes for which they are intended, but there is help for those searching for a xanax detox treatment program. Xanax is used to treat panic attacks, anxiety disorders and severe stress. Xanax increases the brain's gamma aminobutric acid, or GABA activity, creating a sense of peace and calming. Xanax may cause an uncoordinated sleepy feeling the first few days of taking the drug. Once the system is accustomed to Xanax, those feelings pass. Individuals who use Xanax for long periods of time may develop a tolerance and increase their dosage to maintain the same feeling. Xanax depresses the central nervous system. Individuals taking Xanax should be monitored. Side effects may include: fatigue, drowsiness, vision difficulty, chest pain, nausea and vomiting, weight loss, tremors, seizures, jaundice, skin rash, difficulty speaking, dry mouth, difficulty breathing, confusion and suicidal thoughts. Sudden cessation of Xanax may result in painful and uncomfortable withdrawal symptoms. 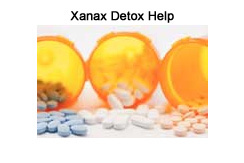 For your safety it is often suggested by doctors to attend a xanax detox treatment, while detoxing. Since Xanax depresses or slows the brain, stopping the drug could cause an opposite effect and lead to dangerous consequences. Withdrawal symptoms include light and noise sensitivity, insomnia, sweating, difficulty concentrating, uncontrollable shaking, depression, vision problems and seizures. Some individuals experience such painful withdrawal symptoms that they return to drug use to ease the symptoms. There has been numerous research studies that have suggested that IV therapy medical detox is seen as the best medical detox in the United States. Detoxification typically begins with a psychological, social and physical health assessments that are tailored to your needs. IV therapy will be used to administer the detox medication. IV therapy is important because it allows the doctors to change your medication on a minute by minute basis for an immediate effect to meet your withdrawal symptoms and to ensure your comfort. When you are ready to leave detox, it may be necessary for you to enroll in a program to help you in rebuilding your life after Xanax use. Freedom Model Retreats has a program that will teach you that drug use is a choice. You will learn to create new habits and behaviors through their Cognitive Behavioral Learning program. Freedom Model Retreats can help you have long term success for a life that is free from drugs permanently.